It’s known as Sin City as well as the Wedding Capital of the world (kinda contradictory, you think?) Famous for “What happens here stays here” (my money sure as hell did!) Viva, Las Vegas! We just got back from spending four nights and three days in Vegas, after a three-plus year hiatus. Much has changed, such as the addition of some new cool places like the Cosmopolitan, City Center with Aria and the Palazzo, to name just a few. And much is still the same, which, for the most part, is a good thing. Here are some of our highlights, and instead of categorizing them into the Good, the Bad and the Ugly (after the 1966 spaghetti western classic with Clint Eastwood, Eli Wallach and Lee Van Clef) I’m going to label these “The Great” – things/places I will definitely revisit next trip ( many of which I’ve already visited a number of times); “The Good” – things I may try again if time permits; and “The Ugly” – things I hope to avoid at all costs. Mon Ami Gabi. This is absolutely one of my favorite restaurants in the world, and mainly for the steak frites, which are marvelous. I gladly jumped off my vegetarian (fish-etarian) bandwagon, which is something I had planned to do as soon as we booked the trip. Mon Ami Gabi is located at the Paris Hotel and Casino (one of my absolute favorite places to stay) and is always packed. Unfortunately, we did not sit outside this time because it would have been almost a two-hour wait, and it was already 8:30 p.m. Click here for a review of this wonderful restaurant. Ooh la la! Mesa Grill. This is another one of my favorite restaurants in Vegas. Located at Caesar’s Palace, I have eaten there a number of times. I love the margaritas and the Flay burgers (aptly name after owner Bobby Flay) are top notch. This time I had the shrimp tacos, which were awesome. As was the cactus pear margarita, as always. I’ll be posting a full review of Mesa Grill soon. Spago. This is a great spot for lunch and people watching. It is one of Wolfgang Puck’s establishments and is located in the Forum Shops at Caesar’s Palace. We always try and sit on the patio to watch the crowds walk by. and to see the “sky” of the Forum Shops changing from morning to afternoon to night. 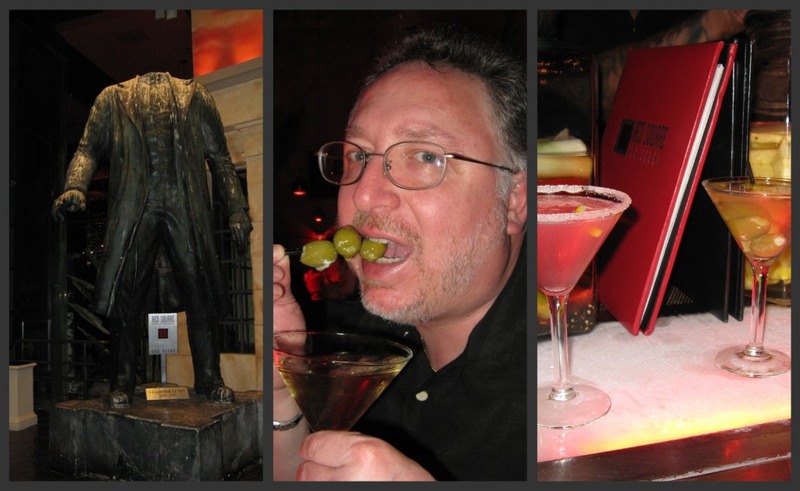 I love the bloody Mary’s at Spago – not sure what’s in the mix since it is homemade, but they are great! Years ago I had one of the best quiches I’ve ever eaten, but alas it was not on the menu this time. The Greek Pizza I had this time was very good, and Brad loved his chicken meatball open-faced sub. Service is consistently excellent. 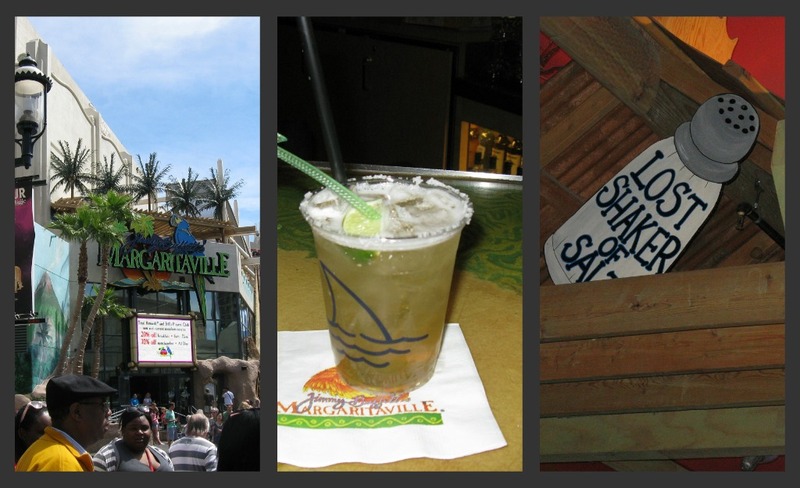 (Wasted Away Again at) Margaritaville. Love this place (at any location) for its burgers and loaded nachos, but particularly for the margaritas, and of course the Jimmy Buffet tunes in the background. We stopped here a couple of times so I could rest my legs (whatever) – didn’t eat on this trip, just imbibed. The Perfect Margaritas (that’s what they’re called) are, well perfect. I also tried the Pink Cadillac Margarita, which consisted of Margaritavilla Last Mango Tequila, Cointreau, special margarita mix and a splash of cranberry, served on the rociks. Yum! Auerole: We saw this restaurant featured on the Travel Channel years ago, and have eaten at it a few times, all good. Located in Mandalay Bay, its claim to fame is the 4-story wine tower enclosed in glass. Wine “angels” are mechanically hoisted to reach the bottles at the top. You order from the extensive wine list on an electronic tablet. I had the seared Ahi tuna this time, which was cooked to perfection. Brad had the pork tenderloin and said it was great. The food came out so quickly that we decided not to order a bottle of wine and each had just a glass instead, with our sights on after-dinner cocktails at Red Square (see below). Red Square. The top of this bar is covered with ice, which keeps the vodka nice and cool. Also located in Mandalay Bay, it is a great place to try different types of vodkas – you can get flights or go the traditional route and just get martinis. It features more than 200 frozen vodkas and infusions, martinis and Russian-inspired cocktails. Nine Fine Irishmen. Located in New York, New York, this is a great Irish pub. The Guinness is good and so is the Jameson’s (which we received liberal pours by our friendly bartender.) If the downstairs bar is too crowded, there is another bar upstairs. 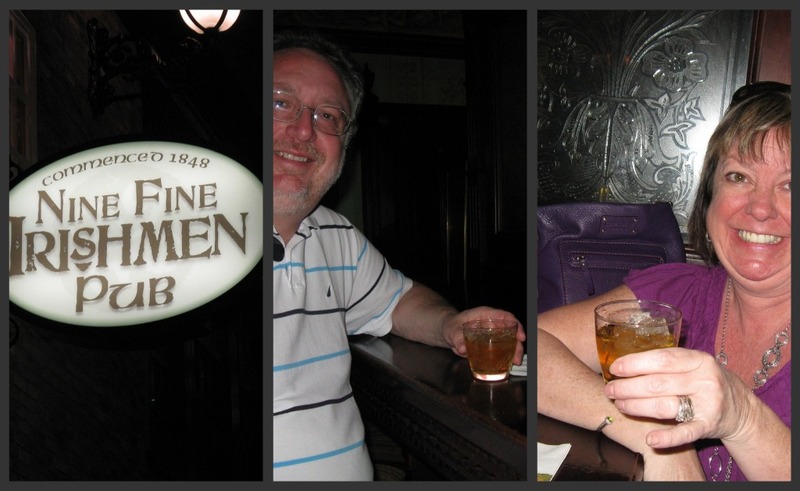 A must stop every trip – Guinness is good for you! Fake Elvises and other street characters. Okay, this really have nothing to do with food, unless I talk about Elvis’ heavy days, but let’s not go there. 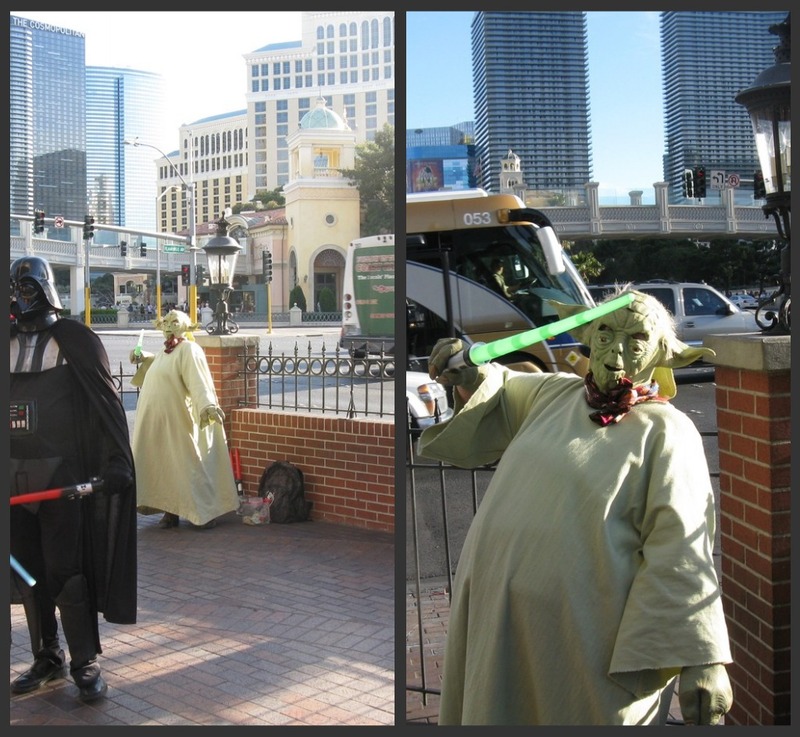 Part of Vegas’ charm is to see these people decked out and just walking around (okay, some are working for tips.) But it wouldn’t be the crazy same without them! Viva, Las Vegas! That’s about it for Part One: The Great. Please stay tuned for Part Two: The Good, and Part Three: The Ugly. This entry was posted in My Favs and tagged Auerole Las Vegas, Bellagio Las Vegas, Caesars Palace Las Vegas, eat drink and be merry, food blog, Jimmy Buffet's Margaritaville, Kel's cafe, Kelley Chisholm blog, Las Vegas casinos, Las Vegas favorites, Las Vegas restaurants, Las Vegas reviews, Mandalay Bay Las Vegas, Margaritaville Las Vegas, Mesa Grill Las Vegas, Mon Ami Gabi Las Vegas, New York New York Las Vegas, Nine Fine Irishmen Las Vegas, Paris Hotel and Casino Las Vegas, Raleigh food blog, Red Square Las Vegas, Sin City reviews, Spago Las Vegas. Bookmark the permalink. 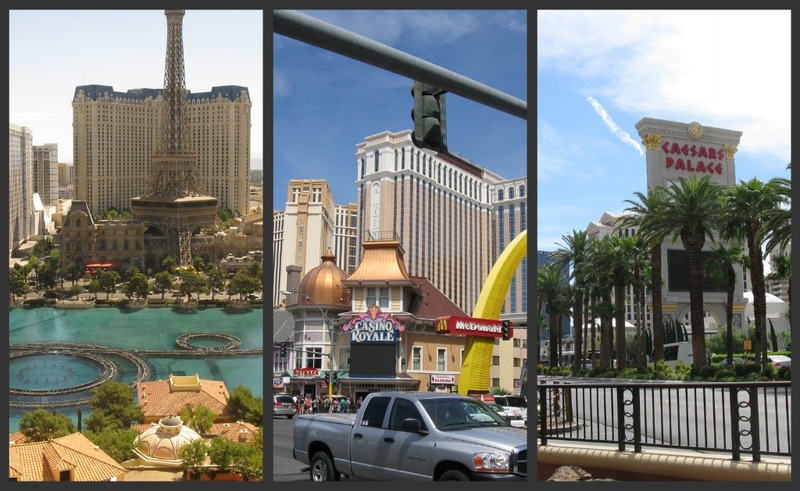 5 Responses to Vegas – The Great, The Good And The Ugly: Part One – The Great!